This bangle is perfect for ladies who love gold and of course, silver jewellery. 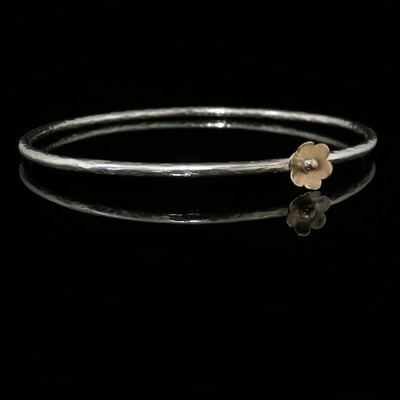 Especially when it is mixed together; with this stunning handcrafted 9ct gold flower soldered to the solid 925 sterling silver bangle. Because it weighs vastly more than the 7.78gm, being the maximum weight allowed by UK law for silver items made in the UK without a hallmark; it has been sent to the London Assay Office and bears the full set of marks as seen above. The first (shield) is m own personal designer's assay and confirms that I am the designer of this delightful piece of jewellery. The others relate to where it has been tested, the fineness of bullion and the year of make. The bangle size guide is also available under Frequently Asked Questions for you to check which bangle to buy. 6.5cm diameter is deemed to be the industry standard, but I would recommend checking.